Outdoor areas are very livable with spots to lounge, dine, read, etc. BR #1: First floor, King bed, TV, private bath, air conditioning and sliding glass doors to patio. BR #2: First floor, double bed, TV, private bath and air conditioning. 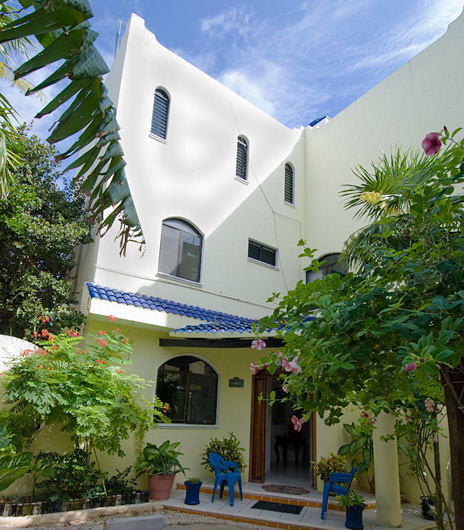 Tucked away in a garden hideaway between Yalku lagoon and Half Moon Bay, Casa Tranquilidad is a charming and economical vacation getaway. This little gem is conveniently located just 5 minutes from the lagoon and Half Moon Bay and several restaurants and convenience stores are within walking distance. 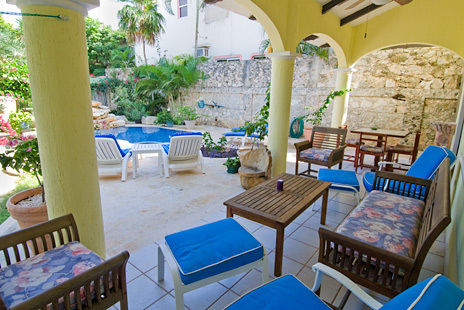 Central Akumal is only 10 minutes down the road. 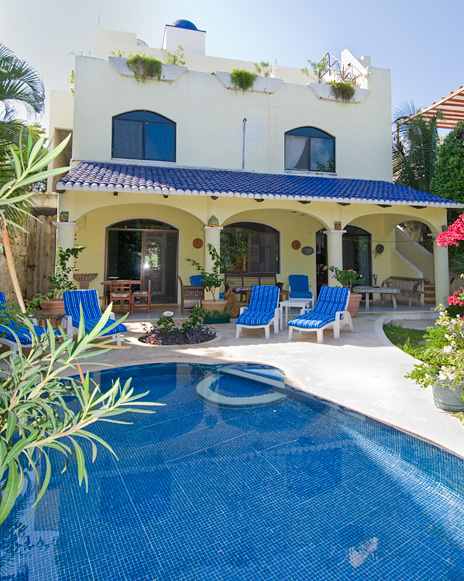 Casa Tranquilidad is a delight, inside and out. Guests appreciate the privacy created by the large privacy gate and lush garden. If you have a rental car, a private parking area is provided, complete with an arbor to shade your car. 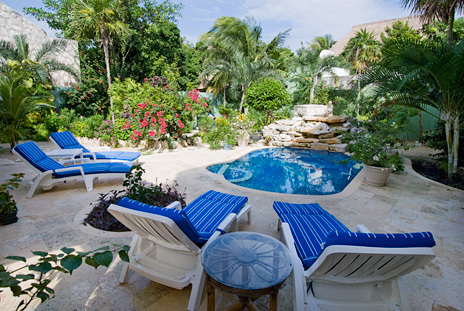 Surely the peaceful garden patio/pool area inspired the name of this property as it is an island of tranquility. 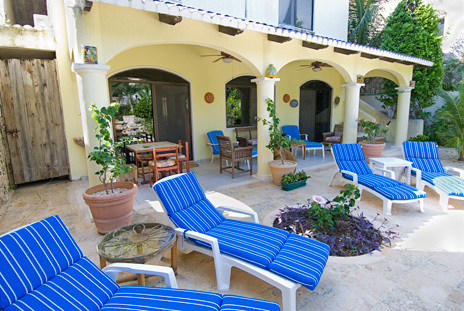 The outdoor living area is nicely furnished with padded chaise lounges and chairs, a sofa, small tables, lovely palms, and flowering tropical plants. The oval splash pool, surrounded by limestone patio decking, is shallow but refreshing and perfect for children (under adult supervision, of course). 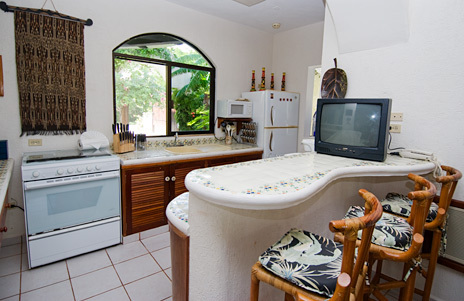 Inside Casa Tranquilidad is a comfy living room, a dining area that seats 6 (plus additional seating at the adjacent lunch counter), a fully equipped kitchen (complete with 6- burner stove/oven, microwave, toaster, blender, coffee maker) and two bedrooms. A TV with satellite service sits on the kitchen lunch counter, facing the dining and living room areas. 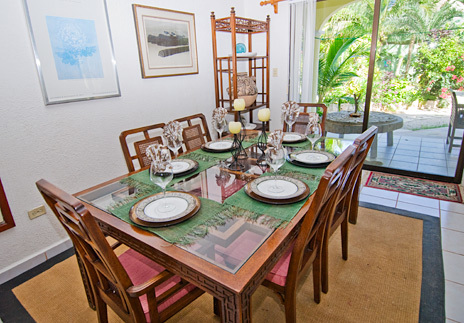 Dining and living rom areas face the garden courtyard with a sliding glass door from the dining room to the pato. 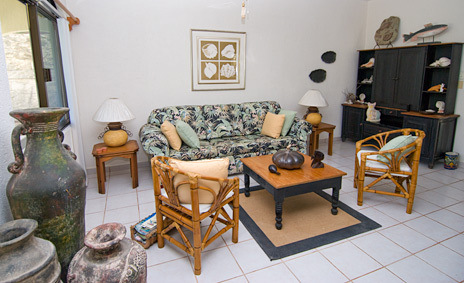 Casa Tranquilidad is an excellent choice for budget-minded travelers who want added amenities. 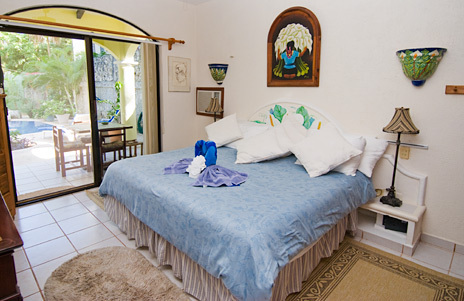 For more than 4 guests, combine Casa Tranqulidad and 2 BR Casa Marina on the second level of Casa Tranquilidad or Casitas Tranquilidad (two 1-bedroom apartments facing the street on the same property) for up to 8 guests. 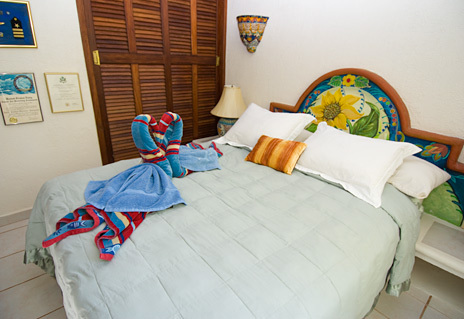 BR #1: Double bed, private bath, a.c.